Using Metrodata EDDs or our Embedded Ethernet Testers (NetTESTERs) an Enterprise Network manager can thoroughly test the network, whenever required, throughout the organisation. Also, they can bring additional value through In-Service monitoring. By implementing protocols primarily developed for the Packet-based Carrier WAN industry, Metrodata's EDD and NetTESTER devices can provide background 'in-service' monitoring of network performance and SLA characteristics. The RFC2544 and Y.1564 test profiles mentioned previously are limited as they require full availability of the service being tested, meaning that these tests are inappropriate for 'in-service' usage. So, the ability to monitor network performance whilst the network is fully available for regular users, without impacting on the throughput of potentially critical data, is an important additional benefit. Normally, on-demand testing would require a dedicated Ethernet test set, featuring comprehensive controls for configuration of all the appropriate parameters to match the SLA required of the network under test. Such devices (see diagram below) are excellent but expensive, and even a larger Enterprise will not wish the expense of maintaining such equipment at all locations. Testing might typically involve a specific trip to site by a well-trained resource, to connect the test set at the demarcation point of the Service Provider's connection and run the test. Moreover, this type of equipment will launch test traffic into the network and require it to be looped or 'reflected' back at the far end of the WAN link, to enable evaluation and report compilation back at the tester. So, it may additionally be necessary to have a suitable resource at the destination point for the network link under test, to facilitate this, as illustrated in the diagram below. Metrodata's family of Carrier EDD's and NetTESTER units support the Layer-3 'Two-Way Active Measurement Protocol' (TWAMP) for in-service and on-demand monitoring of network Delay (Latency), Delay Variation (Jitter) and Packet-Loss parameters across Ethernet and IP infrastructures respectively. 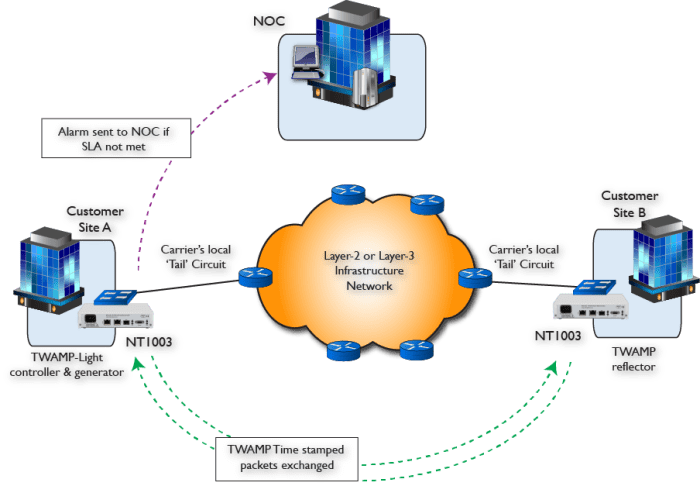 These features enable Metrodata devices to actively monitor key performance characteristics and, furthermore, to issue pro-active SNMP 'Trap' alarms to the Network Operations Centre in the event that any monitored link within the WAN domain fails to meet pre-determined SLA requirements. This 'in-service' and on-demand monitoring functionality also facilitates the collation of long-term traffic profiling data which can be invaluable for understanding the overall characteristics of a network under variable load conditions during an extended period. This underlines the real benefit of permanently embedded and always-accessible test devices, when compared with even the most sophisticated 'plug-in' test sets. The diagram below illustrates the case of the TWAMP protocol being used between two NetTESTER devices to provide alarms to the NOC, should pre-determined maximum levels for Delay (Latency), Delay Variation (Jitter) or Packet-Loss Ratio, be exceeded for traffic across the WAN link between remote sites A and B. The process is identical for Metrodata's range of EDDs. Such monitoring and alarming can enable the Enterprise Management team to respond immediately to potential network performance problems, perhaps even before their users have become aware of any issues. It also acts as a permanent log of the availability and performance of your network against your SLA which may prove useful when renegotiating your contract. Metrodata EDD and NetTESTER units also support Layer-1 network testing features for physical layer faults. Specifically, both product ranges support TDR and optionally automated OTDR (Optical Time-Domain Reflectometry) functionality. OTDR functionality is particularly useful for long haul dark fibre connections where there is concern about disconnection or breakage of the fibre. Metrodata's EDDs and NetTESTER units when enabled with OTDR capabilities can monitor and generate alarms in the event of a fibre fault, issuing an SNMP Trap alarm which when translated via a MIB, can produce a message e.g. "Fibre length previously 40.258km. At time 13:04:26, service down, with fibre length reported as 15.219km". The diagram below illustrates how they could be positioned in the network. OTDR is particularly useful in assisting network managers with the notoriously difficult job of locating the exact location of fibre faults and represents another value-adding benefit of a permanently embedded NetTESTER in your network if the Metrodata range of EDDs are not already being used. Having the ability to test your network on demand or monitor it continuously is clearly very attractive, but it would be highly frustrating if to achieve this you are faced with complex configuration and change management, which is why Metrodata have implemented an easy-to-use menu driven configuration system.